Well this one has a case of mistaken identity surrounding it! 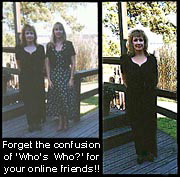 The original photo of the two women was sent to a new online friend by the gal on the left with the line, "I'm the one in the black dress.' But he reads it as '...the one in the black vest.' (Okaaaaaaay. Wishful thinking, looks like.) So off he goes, romancing the wrong woman! But she of course doesn't realize it either, for about, oh, four months. Well KTIA is not at liberty to reveal what ensued, but we can tell you that she would have saved all three of them a ton of woes if only she'd been PicsTricked in the first place!